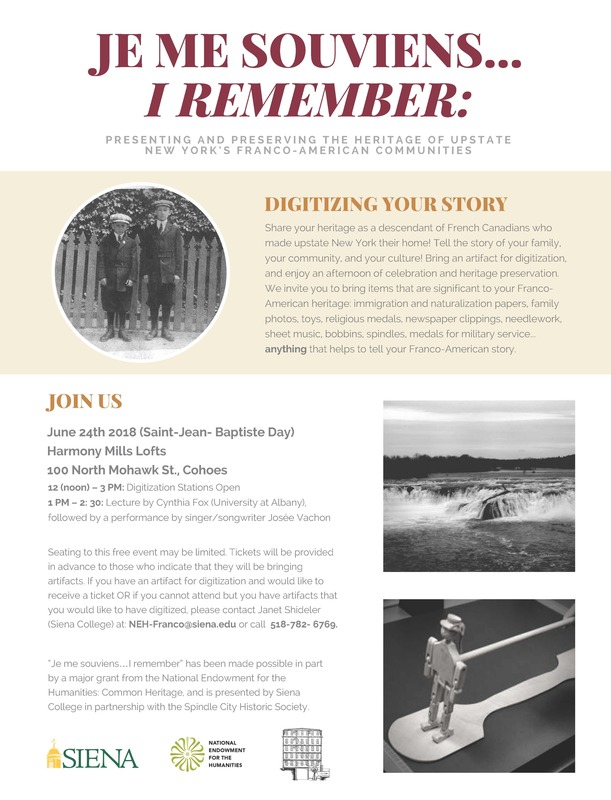 Our annual meeting for CDLC contributors to New York Heritage followed by a reception for recently retired Digital Field Trainer, Ilka Morse, from 3:30 - 4:30. This flyer was created for an event which took place on June 24, 2018. The event was a partnership between Siena College and the Spindle City Historic Society and was made possible by a major grant from the NAtional Endowment for the Humanities: Common Heritage. This form was created to gather metadata for items being submitted to Siena College's Je Me Souviens project. The project's aim is to present and preserve the heritage of the Upstate New York Franco-American Community was made possible by a major grant from the National Endowment for the Humanities: Common Heritage. Slides by Sarah Siddiqui on working remotely for Crandall Public Library (Glens Falls) on a project to add items to their Folk Art and Artist Collection in New York Heritage. << Previous: 06/28 - InfoMingle Albany!